Special thanks to: Emmanuel Halleux and Hendrik Meersschaert for their help and assistance. 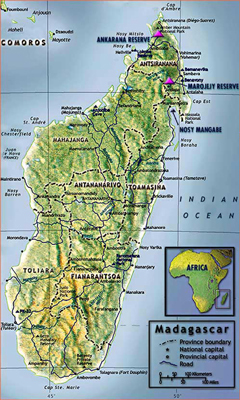 Madagascar is an island nation lying to the east of the coast of Africa in the Indian Ocean. It is the world's fourth largest island. The country also claims several small offshore islands (Juan de Nova, Europa, the Glorioso Islands, Tromelin, and Bassas da India) all currently administered by France. The earliest history of Madagascar is unclear. Africans and Indonesians reached the island in about the 5th century AD. The Indonesian immigration continued until the 15th century. From the 9th century on, Muslim traders (including some Arabs) from East Africa and the Comoro Islands settled in NW and SE Madagascar. Probably the first European to see Madagascar was Diego Dias, a Portuguese navigator, in 1500. Between 1600 and 1619, Portuguese Roman Catholic missionaries tried unsuccessfully to convert the Malagasy. From 1642 until the late 18th century the French maintained footholds, first at Taolagnaro (formerly Fort-Dauphin) in the southeast and finally on Sainte Marie Island off the east coast. In 1883 the French bombarded and occupied Toamsina (then Tamatave), and in 1885 they established a protectorate over Madagascar, which was recognized by Great Britain in 1890. In 1896, French troops under J. S. Gallieni defeated the Merina and abolished the monarchy. Queen Ranavalona III was sent into exile in Algeria in 1897, effectively ending the monarchy. Foreign settlers, principally French, and French companies appropriated land for coffee plantations and established an agricultural based economy. The French held Madagascar continuously, except for a brief period of British occupation during WW II. A major revolt was crushed in 1947 at the cost of possibly as many as 80,000 Malagasy lives. In 1958, Madagascar became an autonomous state within the French Community. Madagascar underwent a peaceful transition to full independence in 1960. Philibert Tsiranana, the first president, gradually became more oppressive. He crushed a revolt in the country's south in 1972. . He resigned soon after and handed power to army commander, General Gabriel Ramanantsoa. Ramanantsoa freed political prisoners jailed by Tsiranana, began to reduce French influence in the country, broke off relations with South Africa, and generally followed a moderately leftist course. In 1975, a new constitution was approved that renamed the Malagasy Republic the Democratic Republic of Madagascar. This change was reflected in the Orders of the country. By the late 1970s Madagascar had severed all ties with France and the government was seriously courting communist nations. Ratsiraka won re-election in March 1989 under dubious circumstances, which led to riots. The early 90s were plagued by civil unrest. After a four-year rule by Professor Albert Zafy that failed to unite the country, Ratsiraka was voted back into power in 1996. During Zafy’s rule, the country’s name was again changed to the Republic of Madagascar. Growing opposition to Ratsiraka led to the popularity of Marc Ravalomanana, the mayor of Antananarivo. Presidential elections in December 2001 were inconclusive, with both Ratsiraka and Ravalomanana claiming victory. Ravalomanana declared himself president in February 2002 and set up shop in the capital of Antananarivo. Ravalomanana soundly defeated the fragmented opposition in elections in December 2002, thus securing the legitimacy of his government. First the actual name of the country has gone through a series of changes including REPOBLIKA MALAGASY, REPOBLIKA DEMOKRATIKA MALAGASY and currently, REPOBLIKAN’I MADAGASIKARA. The national flag of Madagascar is a tricolor consisting of a vertical white field and two horizontal fields (red over green). Each of the fields is identical in area. The colors of the Madagascar flag represent Madagascar's history, yearning for independence, and traditional classes. Red and white were the colors of the Merina kingdom, which fell to France in 1896. The colors were used in the flag of Queen Ranavalona III, the last Merina monarch. They also represent the ethnic origins of the Malagasy people in Southeast Asia, and are shared by the flag of Indonesia. Green was the color of the Hova, a class of commoners who played a significant role in the independence movement. The modern day interpretation of the Madagascar flag colors believes that red stands for sovereignty, white represents purity and green means hope. 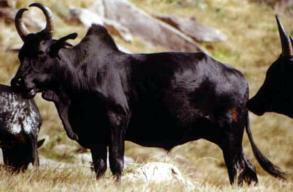 The Zebu (Bos taurus) or humped cattle, a tri-purpose breed of cattle, kept for meat, milk and work with its has lyre-shaped horns and the Baobab tree, whose hollow trunk makes it a practical place to find and store water, to provide shelter, perform sacred rites, and bury and remember ancestors, figure prominently in the national symbolism of Madagascar. 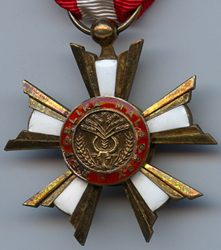 Early models of the Orders and medals were generally finely produced by French companies. 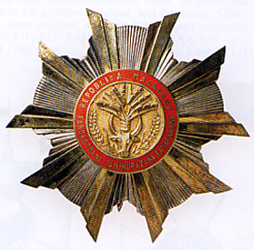 In later years, local manufacturers such as Le Point Multi Service of Antananarivo began producing both the second and third versions of the National Order and the Order of Merit. Although some might disagree, the decline in quality is clearly noticeable. The Order was established in 1958 and modified on September 5, 1960 and July 30, 1980 to recognize individuals, who provide eminent services to the Republic. It was apparently modified again when the country deleted the word Democratic (DEMOKRATIKA) from its name. The President of Madagascar is the Grand Master of the Order. There are six classes Grand Cross 1st Class for Heads of State, Grand Cross 2nd Class, Grand Officer, Commander, Officer and Knight. The Order is in the shape of a five-pointed star with white enamel branches. The center of the obverse is adapted from the coat-of-arms of Madagascar (the head of the Zebu, surmounted by branches of the Baobab tree and framed by two stalks of wheat) and surrounding this on a reddish-brown enamel circle is the inscription, REPOBLIKA MALAGASY. The gilt reverse has the gilt inscription, FAHAFAHANA TANINDRAZANA FANDROSOANA around the edge and in the center, the straight-line inscription 31 OCTOBRE 1958. Type 2 replaced the inscription on the obverse with REPOBLIKA DEMOKRATIKA MALAGASY and altered the central obverse design, replacing the Zebu head with a highly stylized design. The gilt reverse has the inscription, TANINDRAZANA TOLOM-PIAVOTANA FAHAFANA. De Roffignac reports at least one version of the Type 2 with the date, 31 DECEMBRE 1975, on the reverse. When questioned in this regard, he attributes the lack of date on the reverse of the Commander’s badge (page 8) to a manufacturing difference. The locally manufactured Type 3 represents a significant redesign of the Order. 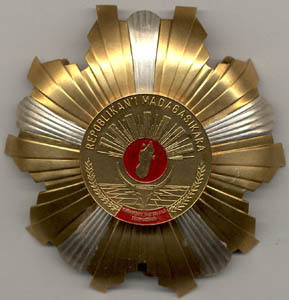 The basic shape of the Order has been retained, but central disk of the obverse has been replaced by the modern coat-of-arms and the inscription on the top of the obverse has been changed to REPOBLIKAN’I MADAGASIKARA. The reverse is now inscribed with the motto, TANINDRAZANA FAHAFAHANA FANDROSOANA. The radically redesigned, locally-made Type 3, 80mm Grand Cross at 54 grams weighs little more than one-half of the 103 gram French-made Type 1. It is constructed of stamped metal and the silver rays are applied pieces of metal and not paint. The sash badges of the Grand cross and Grand Officer Grand Crosses are 72mm and 70mm, respectively. The Plaques for the Grand Cross and Grand Officer are 95mm and 90mm, respectively. The Commander’s badge measures 66mm and the Officer and Knight’s badge measures 42mm. The rosette on the Officer’s badge is noticeably smaller than that of prior types. The Order was created on December 21, 1960 to recognize individuals, who render administrative, political, social, economic or cultural services to the Republic. There are three classes for this Order: Commander (gold), Officer (silver) and Knight (bronze). The Order is circular with the original seal of the State in the center (the Zebu and Baobab Tree) and the inscription, REPOBLIKA on the left and MALAGASY on the right. The reverse contains the inscription, FAHAFAHANA, TANINDRAZANA, FANDROSOANA on three separate straight lines above crossed cotton flower and corn stalk. 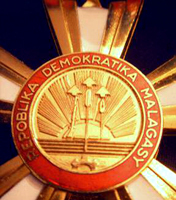 The central design of the obverse is replaced by a highly stylized rendering and the inscription reads, REPOBLIKA DEMOKRATIKA MALAGASY and the reverse motto reads, TANINDRAZANA TOLOM-PIAVOTANA FAHAFAHANA. Type 3 utilizes the modern State seal on the obverse (see Heraldry above) and the inscription, REPOBLIKAN’I MADAGASIKARA. The reverse motto now reads on three straight lines, TANINDRAZANA, FAHAFAHANA, FANDROSOANA. The Commander’s badge measures 45mm in diameter and the Officer and Knight badges are 35mm in diameter. The planchet is suspended from foliage and crossed spear points. The Order was created on August 10, 1962. It is used to recognize individuals who contribute distinguished services in the field of agriculture. There are three classes: Commander, Officer and Knight. The Order is composed of a six-pointed white enamel star suspended from a gilt wreath of foliage. The points of the star are connected by cornhusks. 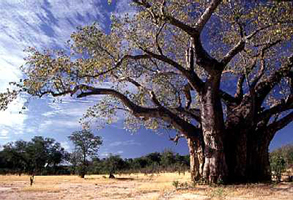 The central portion of the insignia contains the Zebu head, topped by the Baobab tree and framed by wheat stalks, which is surrounded by a green enamel circle with the inscription, REPOBLIKA MALAGASY. The reverse reads, MERITE AGRICOLE on two straight-lines in the center. The Commander’s badge measures 45mm and the Officers and Knight badge measures 35mm. 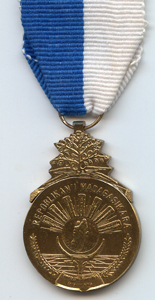 Established February 26, 1960, the medal is awarded by the Ministry of Labor and Social Laws and rewards workers for continuous periods of service with the same employer. There are two classes: silver (15 years of service) and bronze (10 years of service). The obverse contains a crossed pick and shovel protruding through a cogwheel laid on top of an outline of the country, a traditional symbol of work. On either side are the inscriptions, REPOBLIKA and MALAGASY. The reverse contains a cartouche or scroll in the center inscribed, VONINAHITRA NY ASA and the circular inscription, MINISTERE DU TRAVAIL ET DES LOIS SOCIALES around the upper portion and crossed laurel branches around the bottom. The small planchet measures only 27mm in diameter and the ribbon is 30mm in diameter. Established October 27, 1959, this medal was awarded to advisors, who took part in the Provincial Congress of October 14, 1958. There is only one class. The Order is circular with the original seal of the State in the center (the Zebu and Baobab Tree) and the inscription, REPOBLIKA on the left and MALAGASY on the right. The center of the reverse contains the straight-line inscription on four lines DE LA – PROCLAMATION – DE LA – REPUBLIQUE MALGACHE. The circular inscription, MEDAILLE COMMEMORATIVE is above this and below, 14 OCTOBRE 1958. 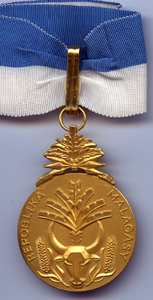 The medal measures 37mm in diameter. There is also a table version as well as a 30mm wearing version of the Tenth Anniversary of Independence Commemorative. 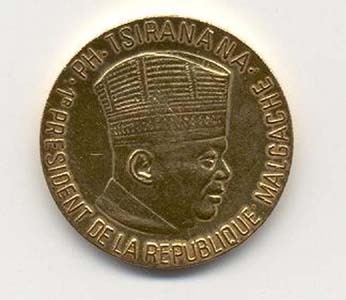 The obverse features the profile of President P. H. Tsiranana and the circular inscription, P. H. TSIRANANA 1er PRESIDENT DE LA REPUBLIQUE MALGACHE. The reverse contains the arms of the 1st Republic above the dates 1960-1970 and the inscription, 10eme ANNIVERSAIRE DE L’INDEPENDENCE – LIBERTE PATRIE PROGRES. The ribbon is unknown. This extremely rare and seldom seen medal was instituted on September 21, 1960 and modified on July 17, 1962. It replaced the traditional French Railway MOH with the small locomotive on the suspension ribbon. It is intended to recognize the service of employees of the national rail system. It is awarded in two classes silver (20 years of service) and bronze (15 years of service). The traditional Malagasy obverse features the Zebu and Baobab tree with the curved inscriptions, REPOBLIKA MALAGASY above and FAHAFAHANA TANINDRAZANA FANDROSOANA below. De Roffignac (page 134) reports a second version with the motto, FAHAFAHANA TANINDRAZANA FAHAMARINANA on the obverse. The reverse features a modern diesel train offset to the right with the vertical inscription, LALAMBY to the left and the curved inscription, ASA VONINAHITRA FANDAVANTENA below the image of the train. The planchet measures 32mm in diameter. Established March 10, 1960, the medal rewards service in the national postal and telecommunications area. The traditional Malagasy obverse features the Zebu and Baobab tree with the curved inscriptions, REPOBLIKA MALAGASY above and FAHAFAHANA TANINDRAZANA FANDROSOANA below. The reverse features a blank center for engraving the recipient’s name and the circular inscription, PAOSITRA SY FANDEFASANTENY at the top and ASA VONINAHITRA FANDAVANTENA at the bottom. The planchet measures 32mm in diameter. It is suspended from a highly stylized, deployed pair of wings with six arrows below (three in each direction, heads facing out), representing the communications sector. Established February 26, 1960, the Order rewards eminent services or performances in the venue of the national sporting effort. It is awarded in three classes Commander, Officer and Knight. The obverse is constructed as three interlocking rings over an Olympic-style torch and flame with a central shield in the colors of the national flag. The top or white panel is inscribed, MERITE SPORTIF and the red and green panels, R and M, respectively. The blank reverse is engraved with the date of the award. The Officer and Knight planchet measures 35mm in diameter.